In the contemporary world of neoliberalism, efficiency is treated as the vehicle of political and economic health .State bureaucracy, but not corporate bureaucracy, is seen as inefficient, and privatization is seen as a magic cure for social ills. 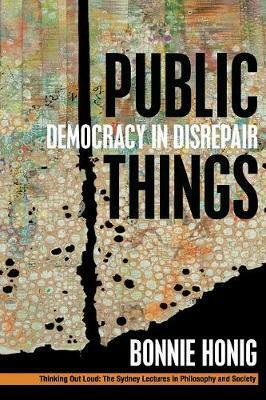 In Public Things: Democracy in Disrepair, Bonnie Honig asks whether democracy is possible in the absence of public services, spaces, and utilities. In other words, if neoliberalism leaves to democracy merely electoral majoritarianism and procedures of deliberation while divesting democratic states of their ownership of public things, what will the impact be? Following Tocqueville, who extolled the virtues of "pursuing in common the objects of common desires," Honig focuses not on the demos but on the objects of democratic life. Democracy, as she points out, postulates public things-infrastructure, monuments, libraries-that citizens use, care for, repair, and are gathered up by. To be "gathered up" refers to the work of D. W. Winnicott, the object relations psychoanalyst who popularized the idea of "transitional objects"-the toys, teddy bears, or favorite blankets by way of which infants come to understand themselves as unified selves with an inside and an outside in relation to others. The wager of Public Things is that the work transitional objects do for infants is analogously performed for democratic citizens by public things, which press us into object relations with others and with ourselves. Public Things attends also to the historically racial character of public things: public lands taken from indigenous peoples, access to public goods restricted to white majorities. Drawing on Hannah Arendt, who saw how things fabricated by humans lend stability to the human world, Honig shows how Arendt and Winnicott-both theorists of livenesss-underline the material and psychological conditions necessary for object permanence and the reparative work needed for a more egalitarian democracy.